Capital City Oysters combines 5th generation farming experience with cutting edge cultivation and processing technologies. Flavor: Pure, crisp, sea salt flavor with a clean finish. Tide tumbled. Oysters spend their entire life suspended off the bottom in bags hung on a line. They are flipped up and down by the tide twice a day, which naturally tumbles the oysters to promote very deep and smooth shells while also knocking off barnacles. We named our oysters after our community, the capital of Washington State. We knew we wanted to put our city on our back and our community in our hearts. 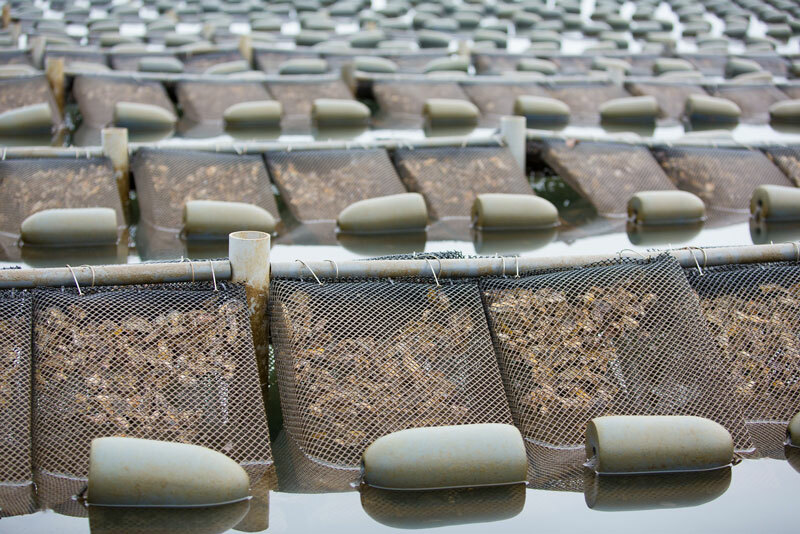 Our method of growing oysters is built around suspension. The oyster bags don’t lay on the bottom nor do they float on the surface. The oyster is suspended in the middle of the water column and feeds on the cleanest and most optimal food. Our oysters are a culmination of five generations in the making. Now 125 years later, we want to share this history with the world, as we write our own chapter in this historic oyster community.